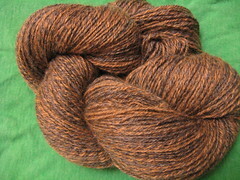 Since I began giving more attention to my Tour de Fleece preparation, I finished spinning and plying some alpaca. I received this from Diane in a Team CrankyPants exchange a couple of TdFs ago. It was great to spin and the skein is so soft and squooshy. The HiyaHiya people were able to help me out, and I felt a bit stupid for not having thought of them in the first place. My friend was able to bring me this 0.5mm steel crochet hook, and it works with my beads. I am now making wonderful progress on the second Emily2 while my other lace cries for attention. Speaking of HiyaHiya, when I got my new hook, I was also able to see a set of the new bamboo interchangeable needles. I think I know what I want for my birthday this year! That means it is, once again, Goat Trauma Awareness Month. The campaign has already served its purpose, as heretofore, I had been unaware. June also means that July is likely to be here next, and along with it, the Tour de Fleece. Things have been underway at Team CrankyPants Training Camp, but I just checked in this weekend. I hope to finish the alpaca yarn I have had on Kiwi for far too long. I spun for a couple of hours on Saturday, taking breaks along the way. Whenever I noticed the time allotted for spinning drawing to a close, I heard, "Annie says, 'No Injuries'," sounding off in my brain like a demented cuckoo clock. Those words of wisdom followed me on Sunday when Kiwi, the pile of alpaca fluff, and I attended a bi-monthly spin-in at the lys. I had not been in so long, but I did well. I did not allow myself to get so nervous as to turn lovely fiber into a felted clump in my hand. I met new people, ooh-ed and aah-ed over so very many pretties, squee-ed over some precious little Kuchulu Spindles, knit a little, and even managed to spin some. In fact, it seemed that I might make my way through all of the fiber I had brought with me. However, there was no need to think I would run out of fiber to spin. One of the women was giving away bundles of fiber she knows she will never get around to spinning, so I came home with quite a bagful of fluff, as well as a bottom-whorl drop spindle. I have plans for some of it for myself, know that some is for others, and the rest will speak to me in due time.